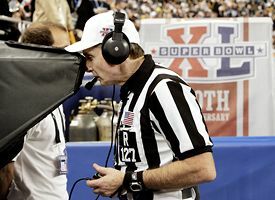 After Super Bowl XL referee Bill Leavy's recent soul-baring admission that he blew a few calls in that game, his old boss has stepped forward to disagree. First, he didn't "kick" two calls in the fourth quarter. He was clearly incorrect when he called Matt Hasselbeck for a low block after the interception when Hasselbeck attempted to go low through a blocker in an attempt to make the tackle. It would only have been a foul if Matt would have made contact with the blocker, but he didn't, so it should not have been called. Leavy piled on himself by saying that his holding call on Sean Locklear was incorrect. That is not true. It was a hold and should have been called. If anything, you could have made a case that the Steelers were offside and, if the play had been officiated correctly, the penalties would have offset and the down replayed. In any case, the reception would not have been allowed to stand. "Did Leavy's calls determine the winner of Super Bowl XL? Absolutely not! In truth, there were missed calls that went against both teams. Let's all put aside our allegiances and go back four years and look at the game objectively. If we do, we will see that the Seahawks did not play well and neither, actually, did the Steelers." Truer words have never been spoken. And hopefully, this will be the last time we have to hear about this tired old topic. Am I the only one who remembers Randle El getting practically assaulted near the goal line on a long bomb from Ben? No pass interference call there. We punted that possession when we would have been on the 5 yard line. No one seems to remember that whopper that basically took away 7 points from the Steelers. Ya know, it was 5 years ago, and last I checked, there's a Lombardi Trophy that says "Super Bowl XL" on it in the Steelers offices on the South Side of Pittsburgh that's probably not going anywhere anytime soon. In other words, I still don't care about this. The better team will generally win in spite of a few bad calls... Such as the playoff game against the Colts where the NFL wrongly ruled Polamalu's interception and subsequent fumble as an incomplete pass. Pittsburgh won anyway. Seattle choked it away when Brown missed 2 FG's. We got a questionable flag on a screen pass against Heath that put us at 3rd and 28. Ben stepped up and completed a pass to the 1 despite being pressured and chased. Seattle's clock management in that game was utterly atrocious as well. Let 'em whine all they want; they left points on the field all day. Whining about officiating is for LOSERS...always has been, always will be.